Today’s post is inspired by my Kolkata Food Blogger friend Amrita Gill. Amrita and her husband Vishal are a lovely young couple who run an awesome food blog called Sweet and Savoury. Their blog is a treasure trove of baking recipes from across the world. Vishal’s guest posts are wonderful to read, reflective of the chemistry between the two. 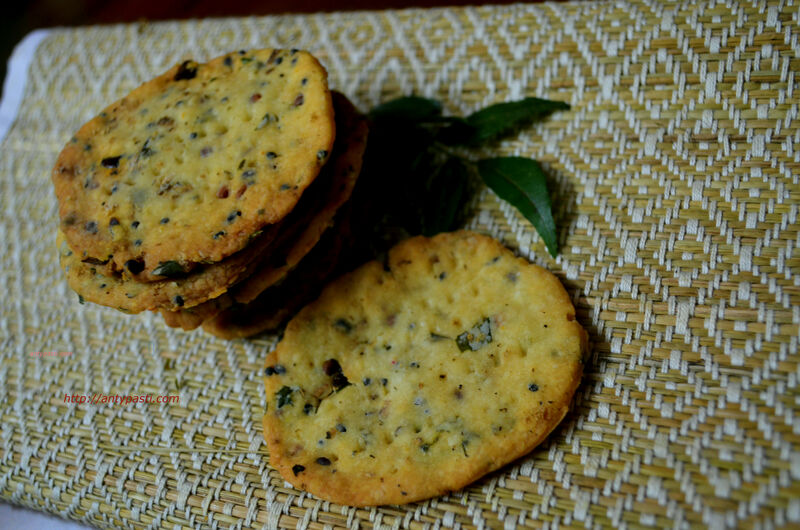 I had my eyes on the masala crackers that Amrita had once posted on her blog, and the ‘know you blogger’ event posed the right opportunity to try my hands at it and post the results! I borrowed her idea on the spices and came up with these fiery Curry Crackers. Best thing is these are eggless biscuits, with curd acting as the binder as well as souring agent. Add the mustard seeds, wait till they splutter. Add the tadka to the self raising flour, season with salt and sugar, and make a dough with the required amount of curd. Place the dough in the fridge to firm up. Remove dough from the fridge, roll it up like a flat chapati. Cut out roundels using a cookie cutter or the lid of a jar. Lay them out on baking sheet lined with parchment. You could refrigerate the sheet if you want more crunch. Previous Previous post: The Chef at Large E-Zine – First Issue! Loved your easy and quick take on it. Curry crackers sound and look awesome. wow, never seen any curry spiced cracker before..
i’me craving this for my brunch snacking!